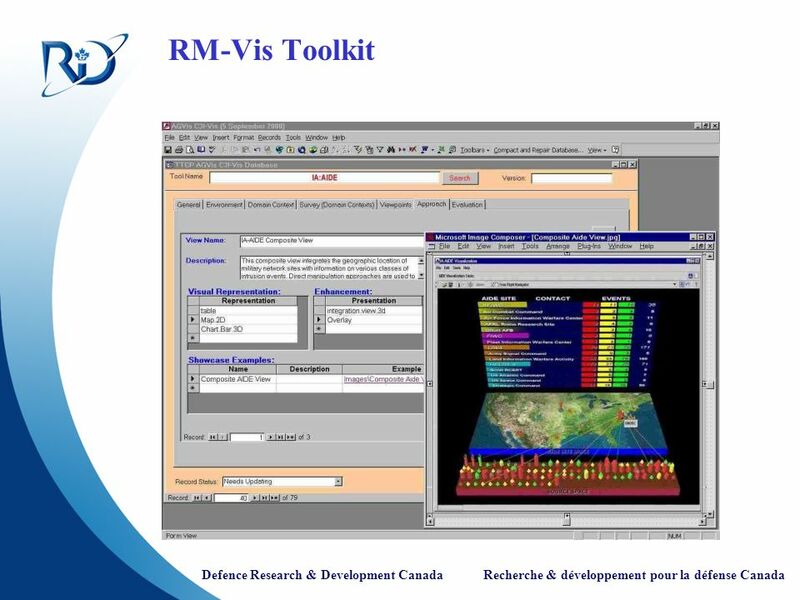 Reference Model framework for the application of Visualization approaches (RM-Vis) was defined to support the characterization, identification and showcasing of visualization approaches in the C3I domain. 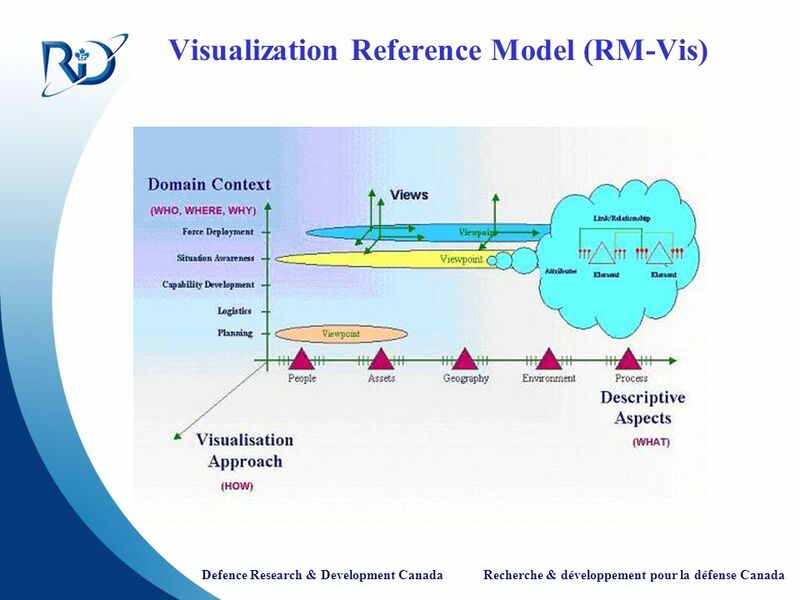 This framework has been used to characterize visualization solutions in terms of their context of use, the representation and presentation techniques used, and key features The Domain Context is a model that defines the focus for the application of visualization approaches i.e. where visualization approaches will be applied, who will be supported, and why it is needed. Descriptive Aspects (DA) define what needs to be described for particular domain contexts. For example, DAs could be defined in terms of the various elements (or things) that are of importance, the relationships between those elements and particular attributes that describe the elements and relationships. 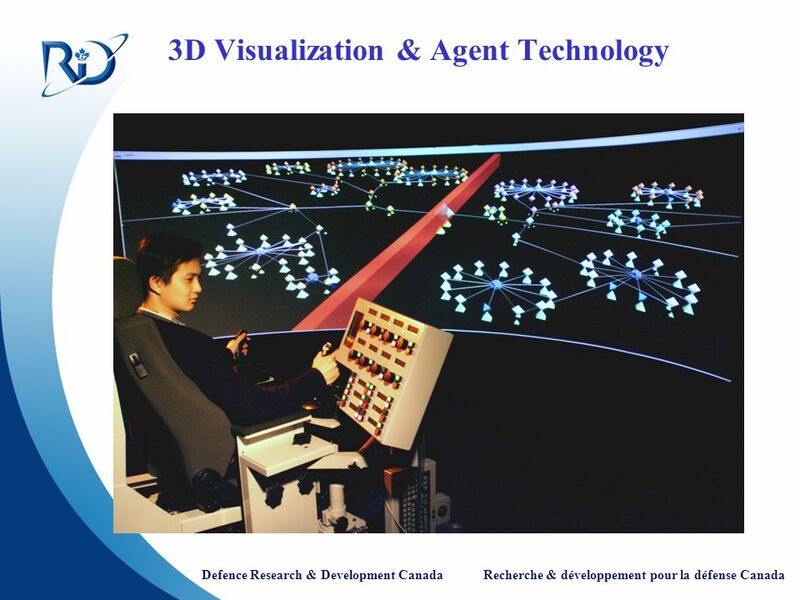 The Visualization Approach dimension defines how the required information can be provided through computer-based visualization. Approaches are characterized in terms of the visual representations used (e.g. graphs, charts, maps), visual enhancements (e.g. use of overlays, distortion, animation), interaction (direct manipulation, drag and drop, haptic techniques etc), and deployment which includes the computing environment (display devices, COTS software) and advanced deployment techniques such as intelligent user support and enterprise integration. 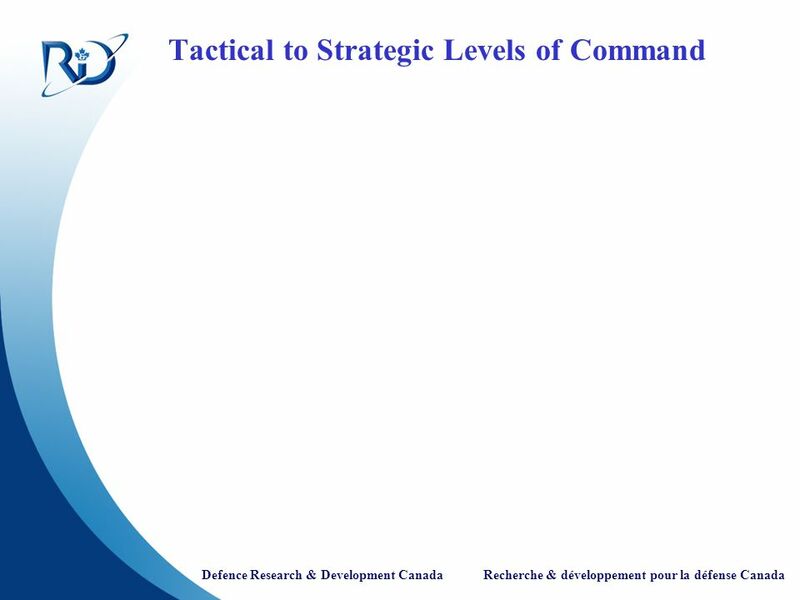 Command and control at the tactical level brings physical constraints that do not apply at the Strategic level of command. These include space limitation, light conditions and operation on the move. At the Strategic level, where there are less physical constraints, one trend is to exploit ‘data wall’ technology. The U.S. Navy at the SPAWAR System Centre is in the process of developing knowledge wall concepts to replace the traditional situation maps that are ubiquitous in modern operations centres. 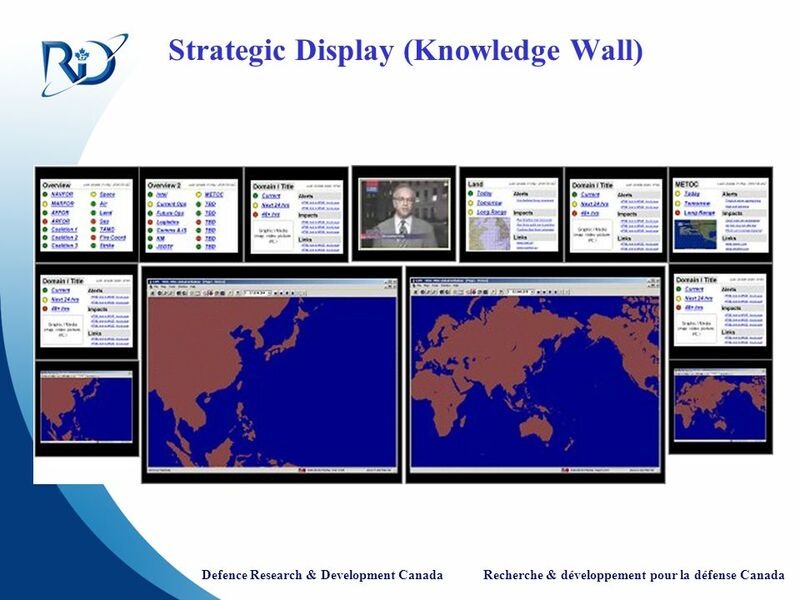 The purpose of the knowledge wall is to foster shared situation awareness, permit continuous updating of the military situation and enhance the senior staff’s ability to interact with supporting information systems. [Oonk et al., 2001] Oonk, H.A., Smallman, H. and Moore, R.A. (2001). Usage, utility and usability of the knowledge wall, (SPAWARS Technical Report). San Diego, CA: SPAWAR System Center. 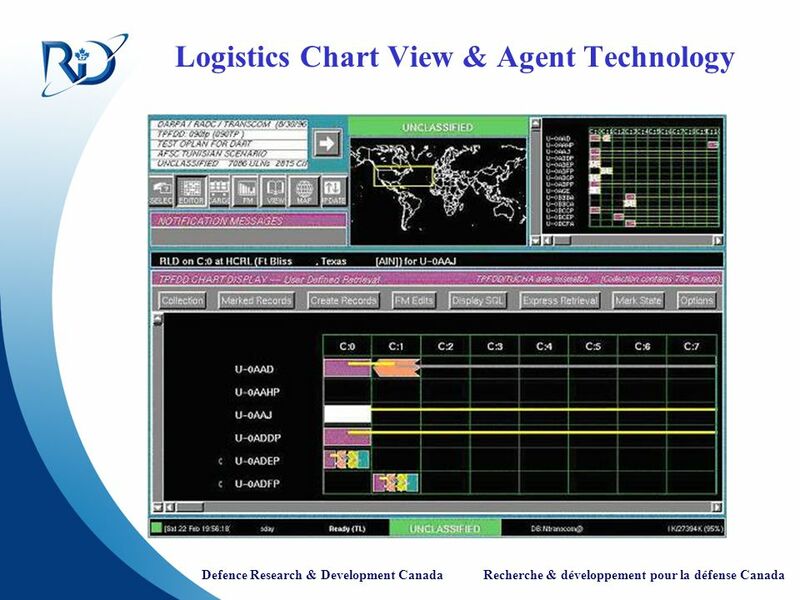 Typical command and control visualizations have consisted of static, standardized symbols overlaid on terrain, frequently referred to as ‘dots on maps’. The following are some examples of where this concept has been advanced. The CPoF program has also experimented with view linking, coordination and sharing. This Figure shows an example of an experimental system that was used as part of a series of Limited Objective Experiments. This view shows a commander’s viewpoint of the battlefield alongside another selected person’s viewpoint (perception or understanding) of the battlefield (e.g. an intelligence analyst). The commander is able to interact and impose his/her understanding and intent on any selected viewpoint with freehand sketches. The intent and understanding of each person’s viewpoint may be shared and communicated so as to provide a shared interactive situation awareness of the battlefield. 10 Blobology Other approaches have used flow animations to represent force movements and degrees of uncertainty. This Figure shows intuitive battlefield visualization using animated blobs (grouping of entities based on behaviour and status: aggregation and temporal compression involved). This view was created using Virtual GIS at the Army Research Laboratories (USA). 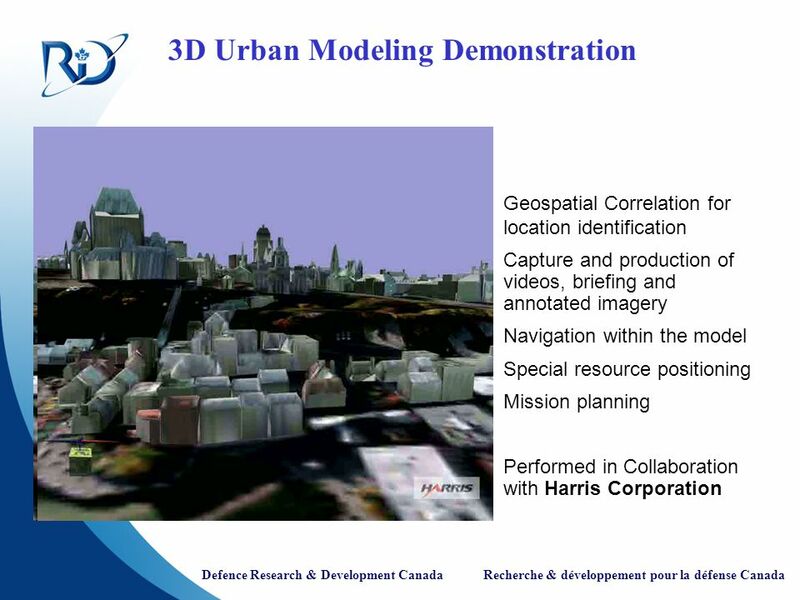 Geospatial Correlation for location identification Capture and production of videos, briefing and annotated imagery Navigation within the model Special resource positioning Mission planning Performed in Collaboration with Harris Corporation The following video clip shows 3D fly-through navigation into the model of Quebec City that was produced in the context of Quebec City. 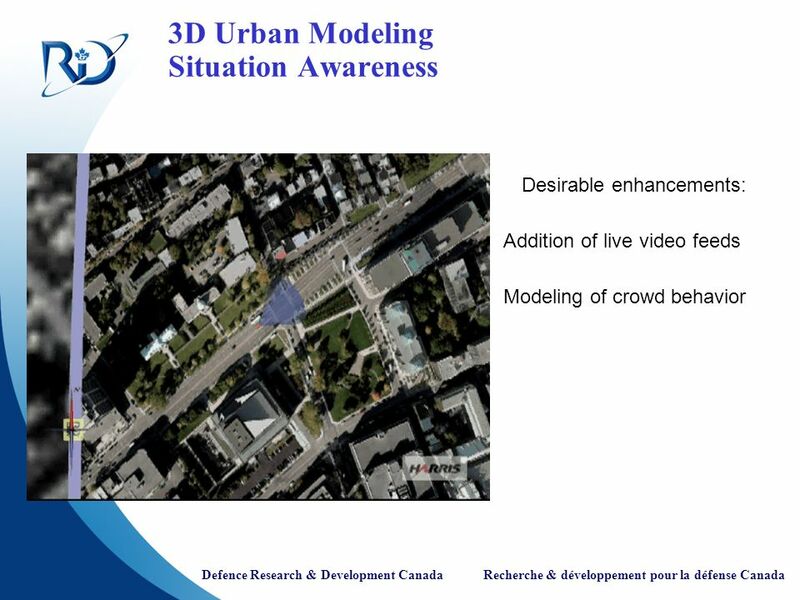 Desirable enhancements: Addition of live video feeds Modeling of crowd behavior The following video clip shows enhanced situation awareness by adding 2D TV feeds into the model. 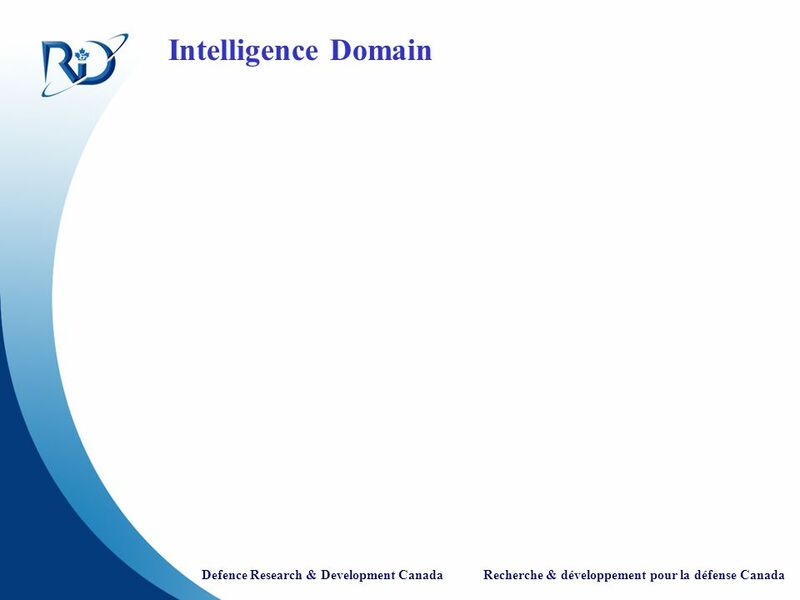 17 Intelligence Domain The intelligence domain has used similar approaches to the command and control domain but with more emphasis on the visualization of abstract information (from multiple sources) and relationships overlayed on geomatic representations and the ability to have linked and coordinated views on the display real estate. 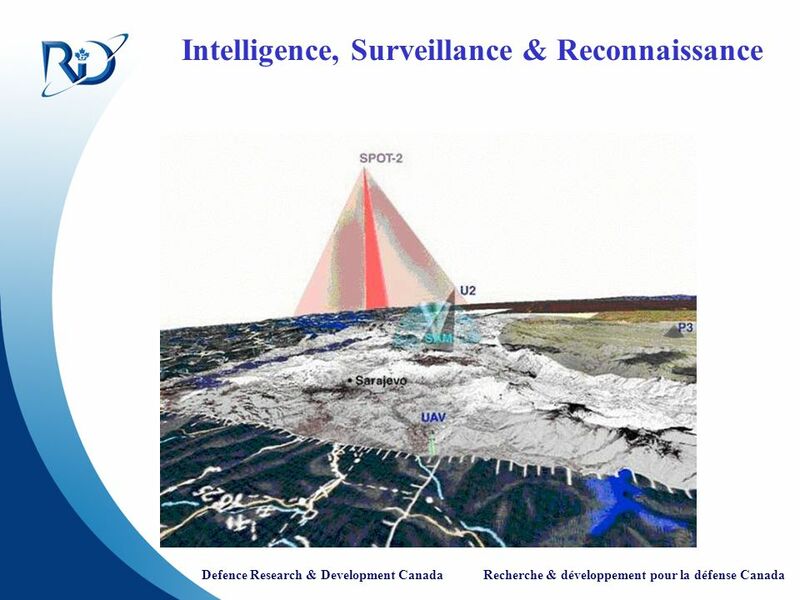 The All-Source Intelligence Producer(ASIP)  from Canada shows the use of geomatic representations with overlayed information. A major contribution of ASIP is in the management of overlays and sharing of views through live channels. 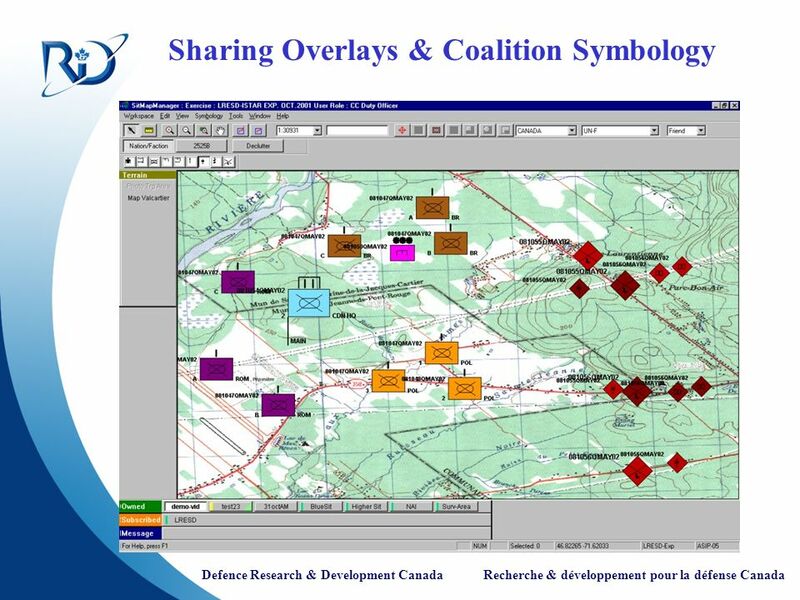 Figure 10 shows an interesting feature of ASIP with coalition symbology, where an optional representation of MIL-STD 2525B allows shobwing the different factions in a Coalition Operation with a different colour, for friendly, enemy and neutral forces. 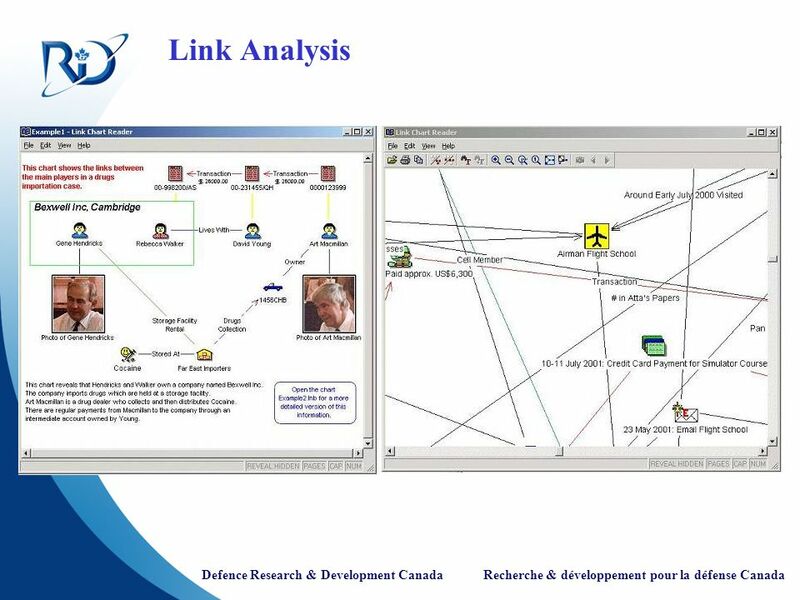 ASIP - the All Source Intelligence Prototype (ASIP) - is a Canadian command and control prototype system aimed at exploring and demonstrating functions for the Intelligence cell [Lizotte, 2002]. 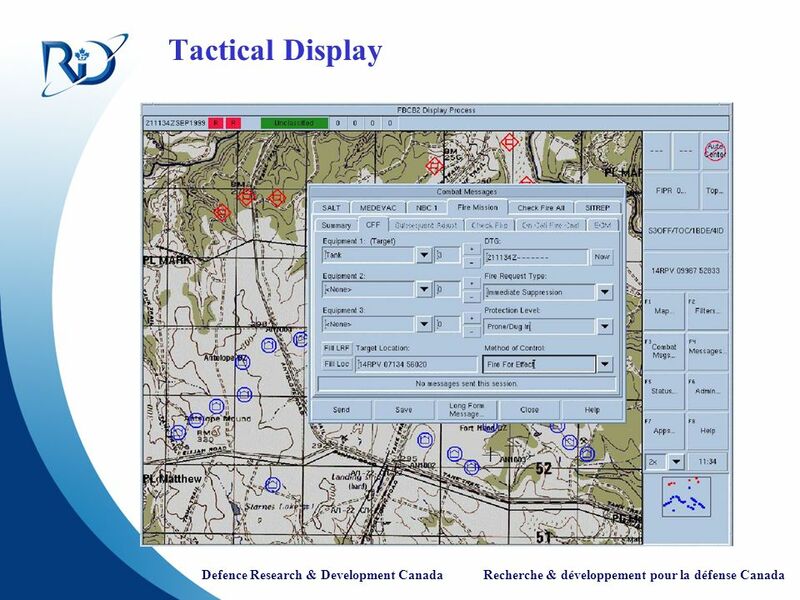 One of its component is the Situation Map application that provides a digital map-based interface, point-and-click and drag and drop user interface, multiple overlays, military map symbology (NATO military symbology standard APP-6(A) and MIL-STD 2525B), map symbol editor, graphical reasoning (tracking, merging, aggregating, link analysis), map symbol palette, annotation, briefing handling. 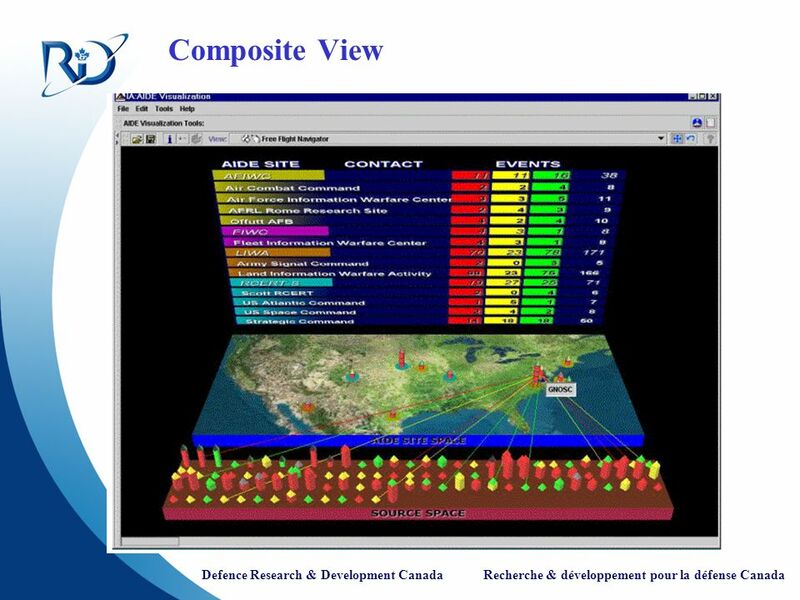 Sophisticated 3D animated representations have been used in the Intelligence Surveillance and Reconnaissance (ISR) area to represent red and blue asset coverage. 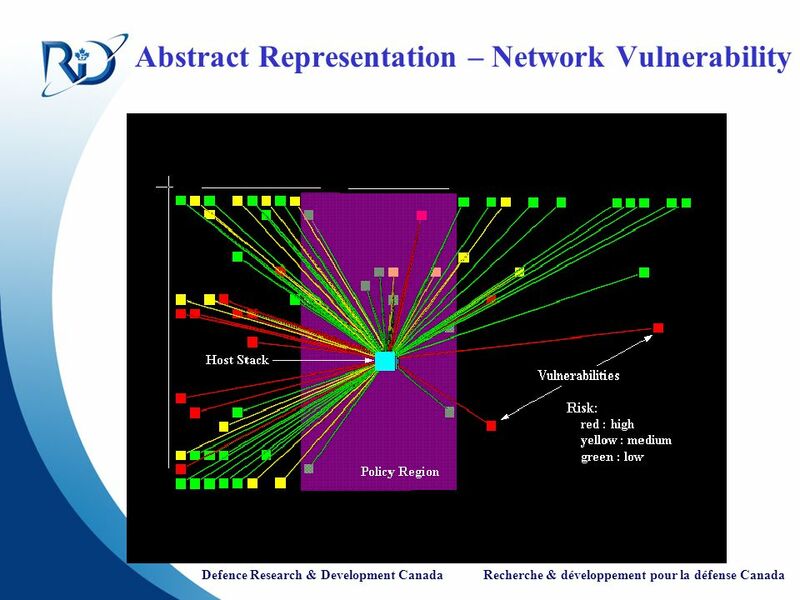 This Figure shows a view from BattleScape where geometric shapes (conical, spherical, etc) have been used to represent ISR asset coverage. This view also shows the concept of integrating imagery with geographic information. 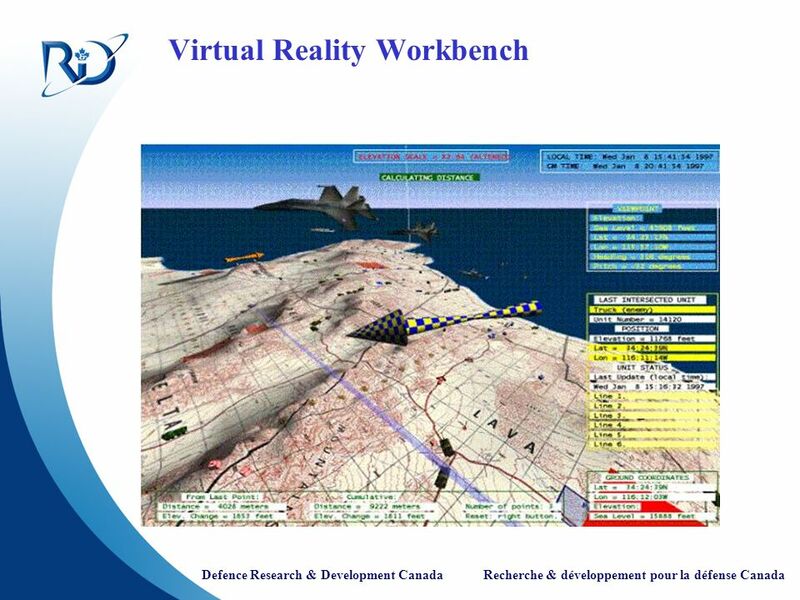 BattleScape interfaces with existing C4ISR processors to create 2D and 3D continuous views of the battlespace, all referenced to digital maps, imagery, and elevation data sets chosen by the War fighter. 21 Logistics Domain In the Logistics domain, resources, assets, inventory, geography, and more importantly, time, process, sequence, status, health and coordination are critical attributes that require integrated visual representations to support logistics activities in dynamic (national and coalition) environments. Another logistics domain tool is the Logistics Watchboard tool from the Joint Theatre Logistics (JTL) ACTD. This Figure shows monitoring for critical logistic events, items, and trends with integrated and linked graphical Gant charts, maps, tables and graphs. This is accomplished through the use of agent technology that either periodically queries data sources or resides within the data source to report key changes in select categories such as readiness, supply status, and support capability. The Logistics Sustainment Analyzer can compare the current and planned situation. If major changes from the support plan are detected, automated cues will notify the user visually. This Figure shows an example from Planimate-Belisi that provides animation, drill down into the details of each unit, sub-unit and function as required, drag and drop of icons, map, and the use of distortion to provide a detail view of an area of interest whilst maintaining the context of the overall picture. Planimate - is software designed for constructing dynamic system models and Animated Management Tools, for use in Animated Planning Platforms. 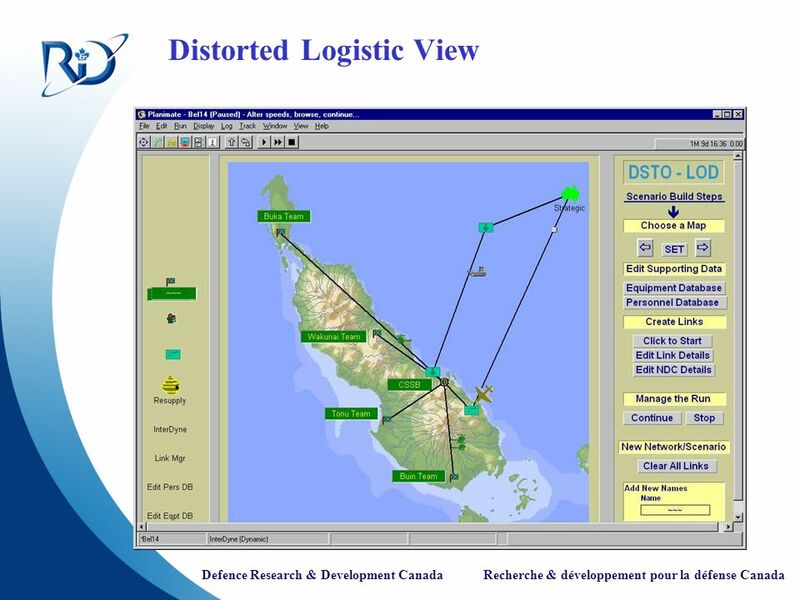 Planimate-Belisi is an instance application developed by the Defence Science and Technology Organisation (DSTO) in Australia to address dynamic logistics planning. 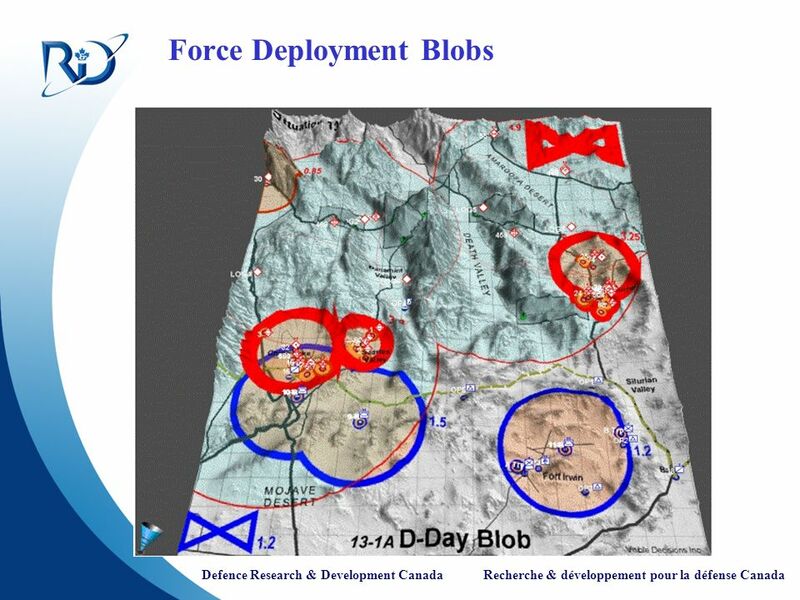 Demonstrated during JWID 02, the Canadian COPlanS is an integrated flexible suite of planning, decision-aid and workflow management tools specially designed to support different Military Operations Planning Processes. In particular, it supports the development, analysis and comparison of Courses of Action (COA) using distributed collaboration services, multi-criteria analysis and a number of visual charts. The user is able to assess the various COAs using a number of evaluation criteria. 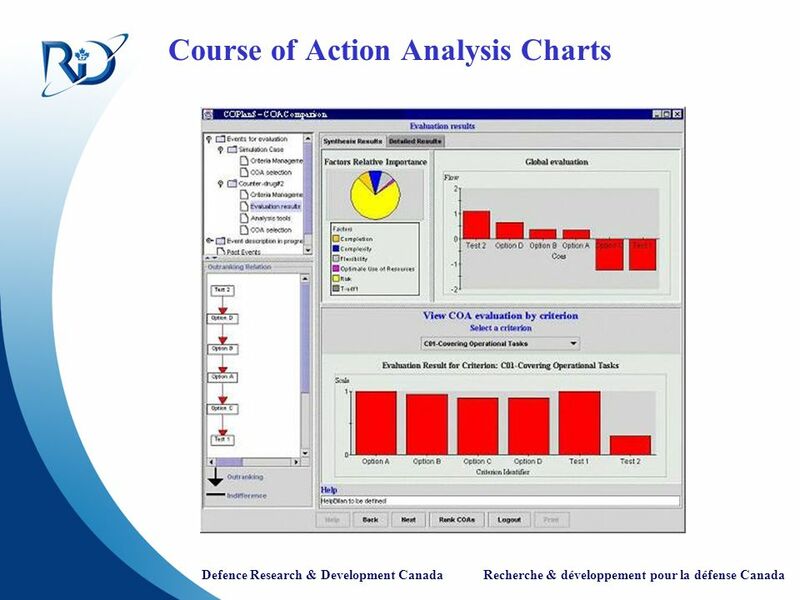 Charts are used to display the evaluation by criterion or globally. Weighting factors can be readjusted graphically. Canada’s Operational Planning Environment and Reference Application (OPERA) is a suite of interrelated tools that provide advanced planning and calculation capabilities. The OPERA folder provides a hierarchical display of OPERA elements and subsequent access to corresponding detailed information. These elements include plans, organizations, equipment, reference documents. Depending on the selected element, the appropriate visualization technique is selected. 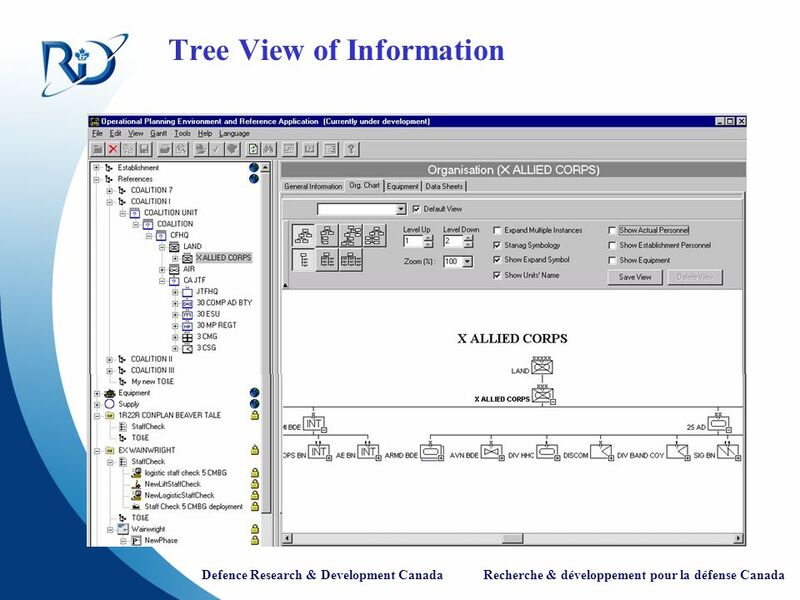 Hence, as shown on the Figure, the ORBAT (Order of Battle) Browser allows the display and edition of military organizations through either a treeview or organisation chart view, with full control over the displayed information and the display of associated resources. The nature of the information operations domain lends itself to the use of abstract information visualization approaches and novel user-to-computer interactions to aid in the exploration and understanding of very large amounts of data/information. The Information Operations domain primarily has focused on information exploration, data/information relationships and trends. Figure 20 provides an example from Shapes Vector, which shows a 3D stereoscopic view of very large networks. Operators interact with the system to determine the nature of anomalies and take action to maintain network security. 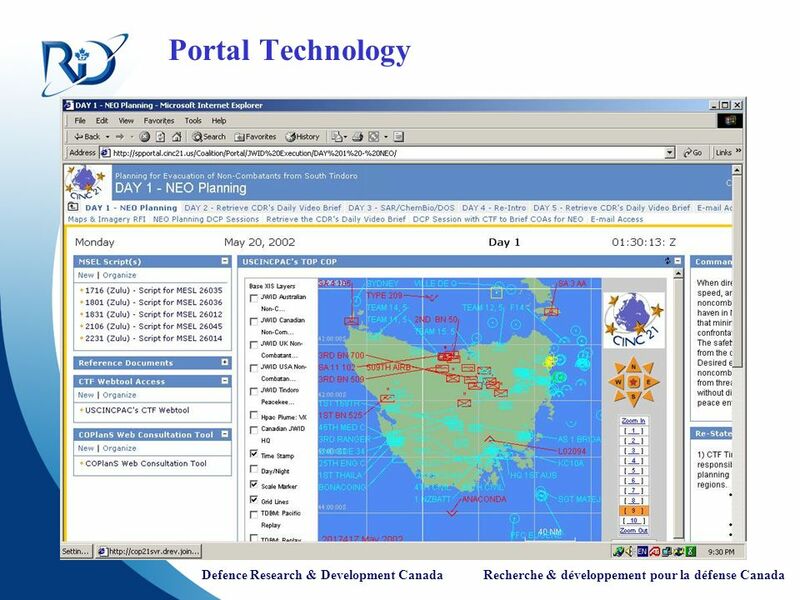 Shapes Vector is an Australian Defence prototype tool used for the monitoring of very large defence networks. Shapes Vector combines three dimensional visualization techniques with innovative artificial intelligent software agents to patrol and report on wide area network anomalies. 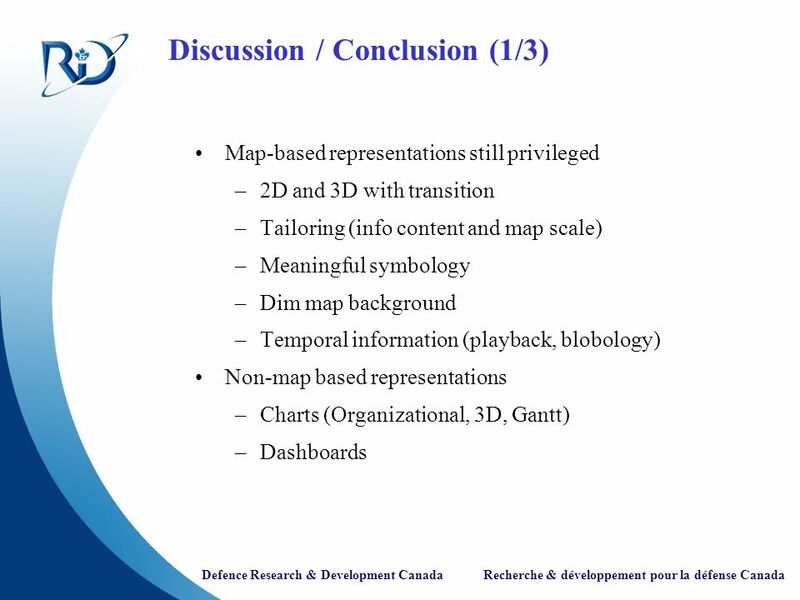 Map-based representations still privileged 2D and 3D with transition Tailoring (info content and map scale) Meaningful symbology Dim map background Temporal information (playback, blobology) Non-map based representations Charts (Organizational, 3D, Gantt) Dashboards This paper has illustrated a number of interesting military visualization examples. Some of them refer to deployed command and control systems while others represent proof of concept prototypes. Although no comprehensive experimentation has been conducted with these systems as part of the AG-3 work, a number of findings can be derived. Map-based representation is a privileged form of visual representation for C3I applications. Still, the examples contained in the C3I knowledge base show a wide variety of interface design, support for user interaction, symbology. 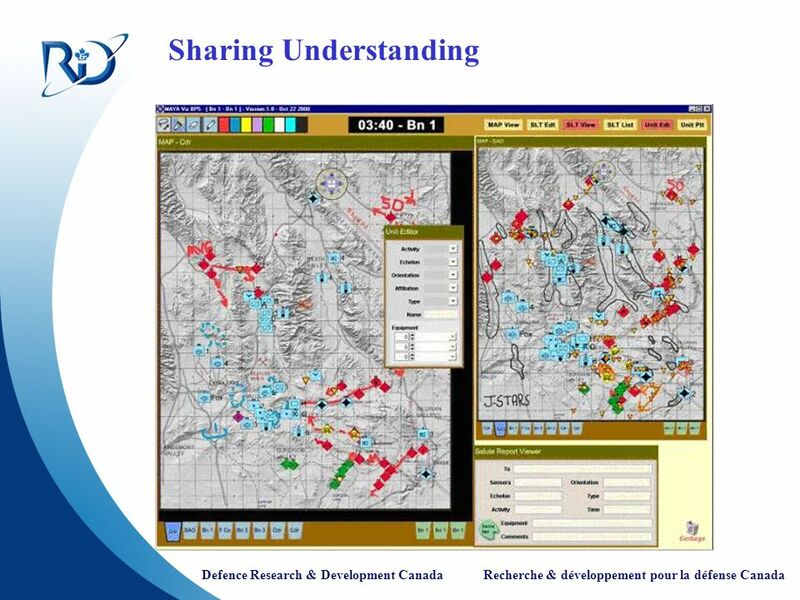 Some of the positive features are: Use of 2D or 3D map representations depending on the task and possibility to transition from one mode to another Information content and map scale that is tailored to the user role / task Use of a meaningful symbology (shapes, colours) including Coalition symbology (different colour for each faction) Capability to dim the map background to highlight overlayed information. Display of temporal information using traces, playback, blobology. In terms of non-map-based representations, there is a wide use of Organization Charts, 3D Charts, Gantt charts and an increasing use of dashboards, in particular for Logistics and Planning applications. 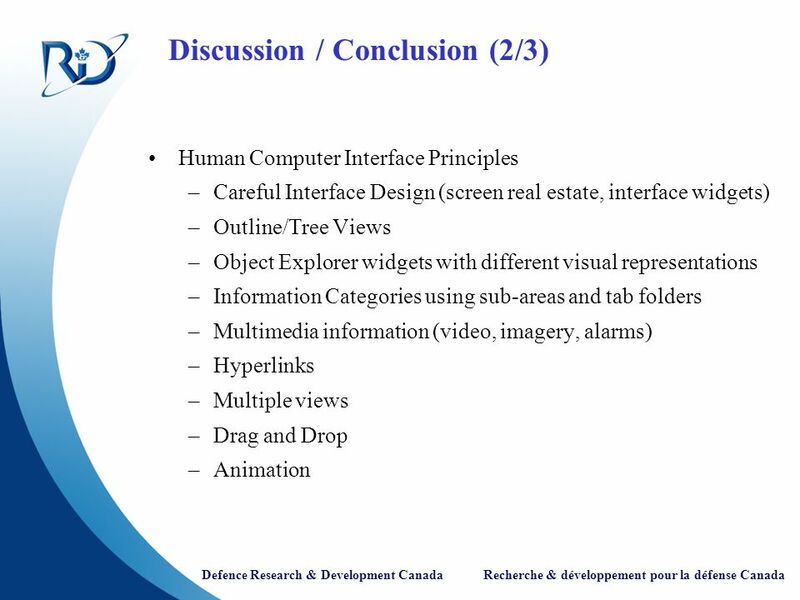 Human Computer Interface Principles Careful Interface Design (screen real estate, interface widgets) Outline/Tree Views Object Explorer widgets with different visual representations Information Categories using sub-areas and tab folders Multimedia information (video, imagery, alarms) Hyperlinks Multiple views Drag and Drop Animation The showcased examples used in this paper highlight the adherence to a number of human computer interface principles that provide an intuitive and efficient graphical user interface: Interface Design. Careful design of the screen real estate and interface widgets to ensure an efficient interface. Outline/Tree Views to present information using a hierarchical representation, with the ability to expand or collapse certain hierarchies selectively. Object Explorer widget also to present a hierarchical view of objects, but selecting an object leads to a different visual representation. Information Categories. Subdivision of the information into meaningful categories, using sub-areas and tab folders. Multimedia information. Use of multimedia (video, imagery, alarms) such as TV feeds, reconnaissance video and collateral imagery to enhance situation awareness. Hyperlinks. Use of hyperlinks to provide association between information elements and a capability to drill down into the information. Multiple views. Information must be presentable in multiple views. Drag and Drop. The user can pass information easily between two applications or tools using drag-and-drop operations. Animation. Use of animation to display temporal information, for example to can playback the current situation or to “animate” a plan. Trends Collaboration Portal Technology Synchronized views Immersive displays Display devices Abstract Information 3D Urban Models Coalition shared situation awareness The examples also illustrates significant trends that are occurring in terms of information visualization: Collaboration. Users realize the benefits of collaboration tools / services to support collaborative work and the sharing of information. Portal Technology. Use of Enterprise Portal technology is a significant trend in providing a common access to information. Synchronized views. 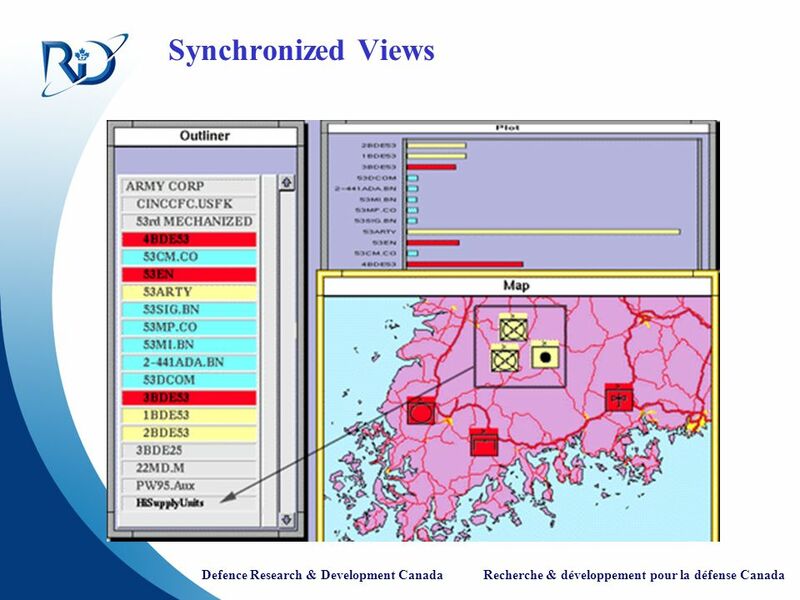 The use of synchronized views has been shown in a number of research programs. Immersive displays. Use of Immersive environments, virtual and augmented reality, and multi-modal interaction are increasingly exploited to provide an enhanced interaction with information. Display Devices. A wide variety of display devices such as large screen displays, data / knowledge walls, two/tri panel displays and head mounted-displays are increasingly used. Abstract Representation. 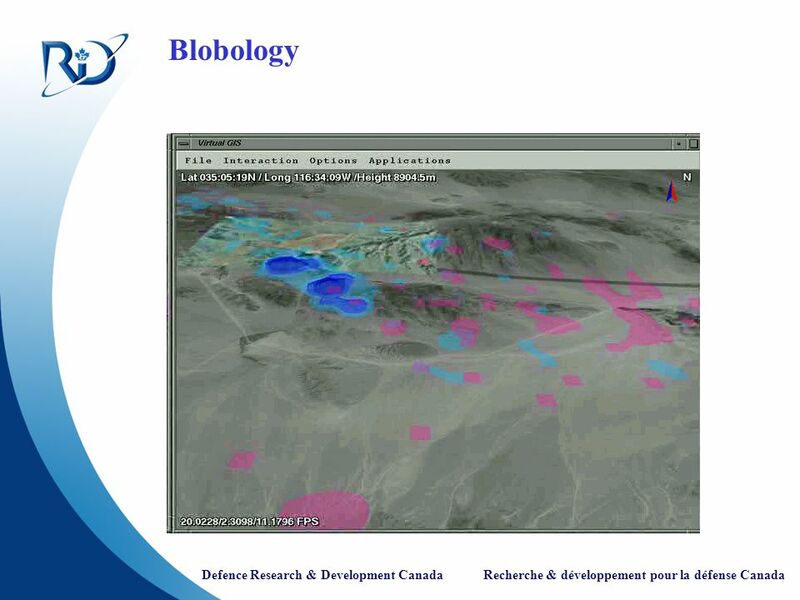 Significant R&D is being conducted in abstract representations and provides solutions to key threats (e.g. network intrusions, terrorist networks). 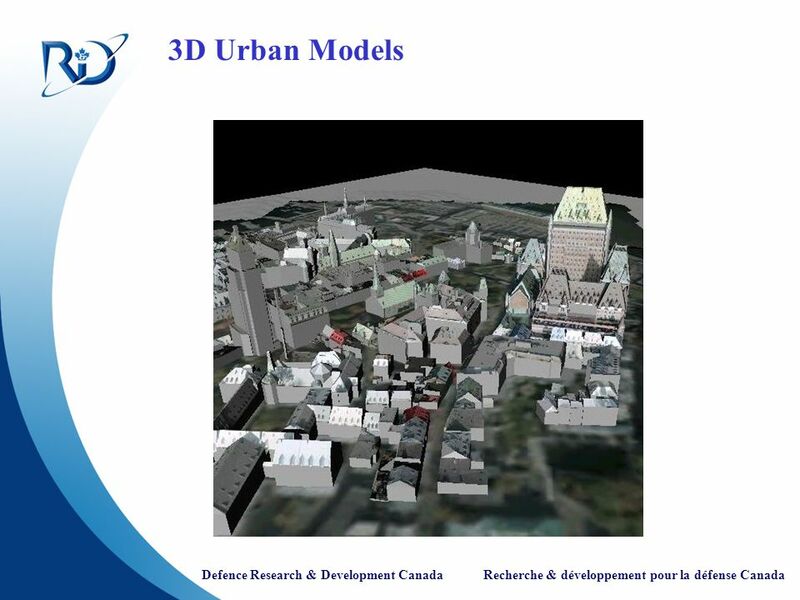 3D Urban Models. 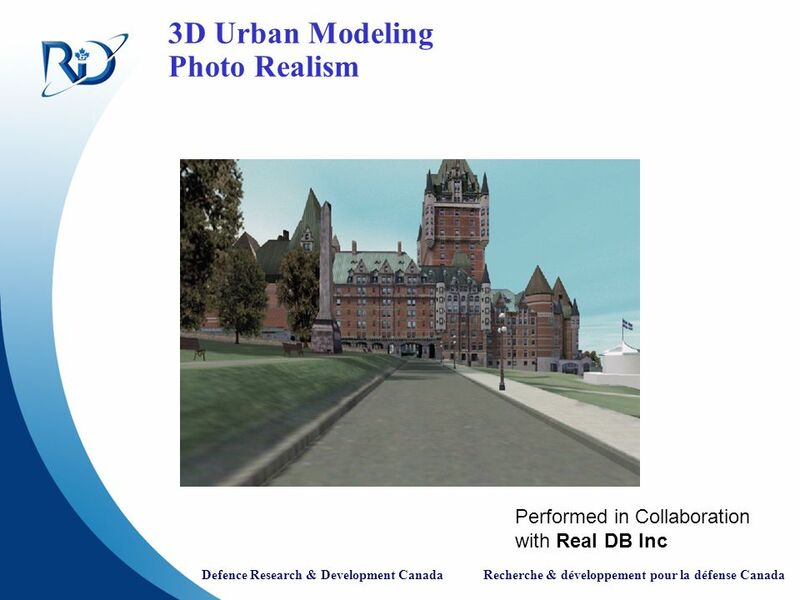 As more and more military operations are taking place in Urban Environments, the use of 3D urban models will improve situation awareness and help in mission rehearsal. Coalition operations. The large number of coalition operations impose a need to work towards visualization solutions that provide a coalition shared situation awareness. 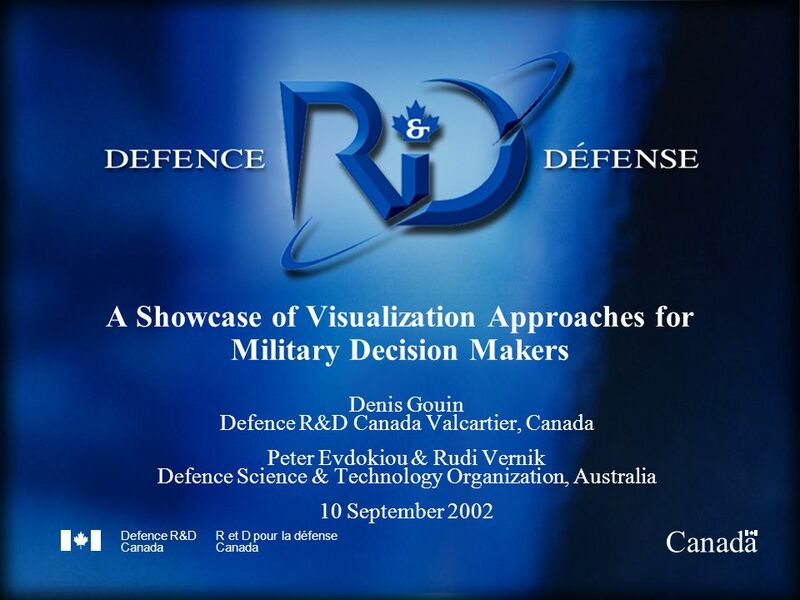 Télécharger ppt "A Showcase of Visualization Approaches for Military Decision Makers"
Cours MIAGE « Urbanisation des Systèmes dInformation » Henry Boccon-Gibod 1 Urbanisation de Système d'Information L'approche Togaf © 2008 The Open Group. UMR 5205 Congrès EEA - 25/02/2014 Design et systèmes numériques (réflexions autour de linformatique pervasive) Lionel Brunie Institut National des Sciences. 14/03/2011 United Nations Environment Programme World Conservation Monitoring Centre CCPAWA Knowledge management: Data portal and mapping tool Gestion. Defence Research and Development Canada Recherche et développement pour la défense Canada Canada 11-1. Proposition pour lévaluation du processus de recherche partenariale Proposal for Evaluating the Research Partnership Process 1 er juin 2010 Colloque étudiant. Consortium québécois sur la découverte du médicament Facilitating creative partnerships in biopharmaceutical research OTTAWA - December 1 st, 2009 Max. Présentation dun modèle dinterface adaptative dun système de diagnostique et dintervention industriel: ADAPTS (Adaptive Diagnostics And Personalized Technical. Introduction : Single Display Groupware Kid Pad : exemple de Multiple Input-devices Première étude sur le Multiple Input-devices Seconde étude sur le Multiple. Design Culture le cas du Computer-Supported Cooperative Work Lorna Heaton Université de Montréal le 27 février 2001.